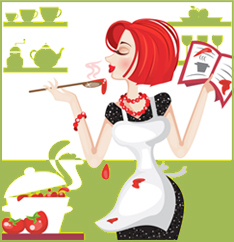 Have you been feeling a little uninspired when it comes to cooking lately? Are you someone who, when you invite friends over for dinner, you usually order take-out instead? Do you live off frozen meals? The kitchen – and cooking – doesn’t have to be the chore it can appear to be. Here are some ideas that will help you feel more excited about cooking and lead you to fun in the kitchen in no time. If you don’t feel inspired or excited when you’re in the kitchen, then you certainly won’t be more inclined to cook in it. 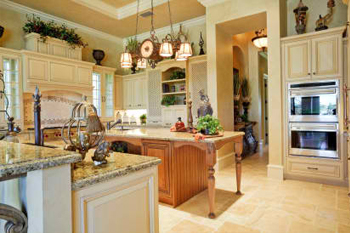 Spend some time redecorating your kitchen so working in it doesn’t feel like such a chore. It’s as simple as purchasing tea towels with amusing prints to hang off the oven handle, magnets to stick on the Bosch Dishwasher, vintage plates and cutlery, a funny apron… creating a fun atmosphere in the kitchen space will soon have you itching to use it and eliminate that feeling of dread. Go to your nearest bookstore or library and pour over the cookbooks, looking specifically for recipes that will work best for you. If you know you’ll only ever have 30 minutes to make a meal, steer clear from the gourmet recipes because they will simply serve to frighten you! If you use books from the library, take photocopies of the foods that excite you and stick these to your Westinghouse Fridge to act as inspiration and a reminder. You don’t always have to follow a recipe to create something easy and delicious. Why not go to the supermarket and shop with the express purpose of cooking something new and different? If you know it’s not for any important occasion and that only you need be the judge, then this is great way to make the kitchen exciting – and learn more about food. If you end up with something truly disastrous, you will at least have a funny story to share! This is great way to fill up a lazy Sunday. Invite your friends over and divide into teams, each using the same recipe, the same ingredients, and the same amount of time. Then have the winner declared by a blind taste test or your neighbours next door. If you’d rather get (what you hope will be) a decent meal at the end of the bake-off, you could designate one team each to prepare the entrée, main or dessert – Masterchef style! You can still eat frozen meals – just cook them yourself in advance. If time really is the key factor that puts you off cooking, then you can work around it. Take advantage of a weekend where you have some free time, take one of those recipes off your fridge and make it to freeze. Not only will you save time, you will save money and feel healthier! You don’t just have to limit yourself to savory dishes here either: baked treats like cinnamon scrolls freeze really well and make a great mid-morning snack with your tea or coffee.